I laid out gardens and groves, in which I planted every kind of fruit tree. I constructed pools of water, enough to irrigate a forest shooting up with trees. At Ladera Frutal, we do have quite a variety of fruit trees, most of them (though not the avocados) planted by my own hands, in the days when my back could tolerate that sort of work. In fact, the number of fruit varieties remains not much below the 150 indicated [formerly] on the banner above, reduced only by the freeze of 2007 (which claimed the most tender subtropicals) and some ‘natural’ attrition (fruit trees are living beings, all of which must die at a time unknown to them–or to the grower). However, we no longer have the means to irrigate a forest shooting up with trees. The photo above shows what the Ladera Frutal avocado grove now looks like. Yes, it is dying–by design. I had been leaning towards abandoning avocados for some time, for ethical reasons. Over time, as I became more steeped in organic agriculture and food ethics–and, especially as I have developed my own modern Jewish perspectives on those themes–I came to question why we grow what is essentially a rain forest crop in what is very nearly a desert climate. This is not a good use of our scarce resources. Yet what ethics did not lead me to stop doing, economics finally did. With water costs rising and increased imports, and more recently the general economic squeeze affecting most of us, it was time to let the avocado grove go. The trees are now left to fend for themselves, despite what could have been a good crop in 2009. Isn’t that a sad sight? 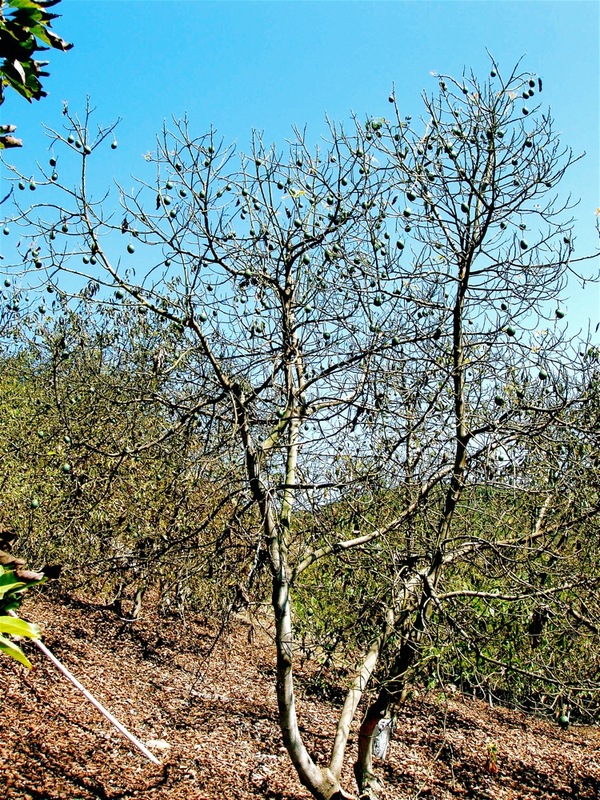 A Hass avocado tree laden with fruit–but hardly a leaf to be found. Even if it suddenly began to rain, this fruit would be nothing but ornamental orbs. When a fruit tree has fruits, but loses its foliage for lack of water, it draws on the fruit to sustain itself as best it can. From the tree’s perspective, all that fruit is just an emergency pool of water. A time for planting and a time for uprooting the planted. Ideally, I would uproot the avocados and replace them with a more climate-suitable crop, like olives or grapes. Such crops are ideal for this dry Mediterranean climate, and at one time they were common in San Diego County. Then came the avocado revolution, thanks to cheap water ‘imported’ from our state’s northern reaches and some very crafty and state-subsidized marketing campaigns promoting California Hass avocados. Olive oil consumption is rising dramatically in the USA, so there could be a market. And wine production is returning to this county. Maybe we are in a transition. If so, it is a transition to be welcomed, back towards more sustainable and suitable crops. Avocados are a wonderful fruit, but the Hass (more water hungry than most varieties) really should not be taking up scarce water in a time of what appears to be an increasingly dry climate. The quotes in this planting, as many a reader may have recognized, come from Ecclesiastes. This biblical book is traditionally read during Sukkot, the holiday just about to wrap up. As a read, it is a tad melancholy, even as it tells us to enjoy our days under the sun–or, in the case of Sukkot, the Season of our Joy, perhaps that should be under the stars and the rain (if only!) or the wind, or whatever else the elements send over our fragile existence. 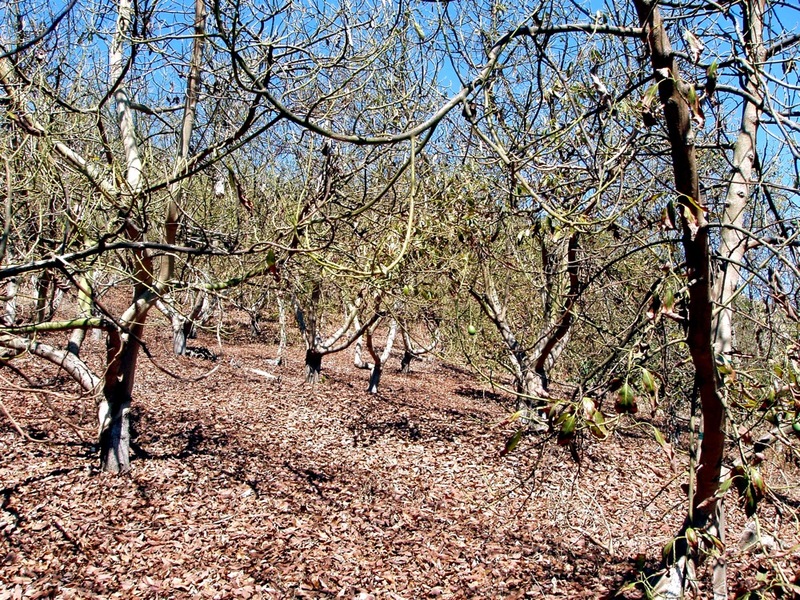 Obviously there won’t be any more avocado harvests to be ingathered at Ladera Frutal, but aside from the former commercial production, “every kind of fruit tree” under the sun remains a core activity around the finca. there is a frustration that occurs in the world: sometimes an upright man is requited according to the conduct of the scoundrel; and sometimes the scoundrel is requited according to the conduct of the upright. I say all that in frustration. Indeed. And this is the season not only for rejoicing in the harvest, but soon for using our individual voices as best we can to send a message that we have had enough with that frustration, enough with the scoundrels. Cast wisely and enjoy democracy’s days under the sun, for we never know when their end might come. Why should I be happy and even celebratory over another fast food chain that opened kosher outposts? The food just isnâ€™t good, period. These fast food restaurants are all about everything that is bad in American pop culture. Frankel and groups like Hazon, which sponsors The Jew & The Carrot blog, are suggesting that we widen our definition of Jewish and kosher food. Instead of celebrating our co-option by corporate culture, they are promoting efforts such as community-supported agricultural (CSA) programs. Such programs, often run through synagogues, Hazon, and other groups, put congregants in touch with area farms, which provide regular deliveries of organic, local produce to subscribers. In addition to supporting sustainable agriculture and local farmers, a Jewish CSA, writes Hazon, offers a chance to re-examine and potentially redefine what it means for food to be â€œfitâ€ ((Kosher means ‘fit’ or ‘proper.’)) not only for us, but for the community and the earth as well. Double amein. Local and organic: Fit food for all. What is a “wild” crop? One that is not cultivated, correct? That certainly is my understanding of the word, wild. As far as I know there is no labeling standard for the various products that are called “wild,” and thus cultivated fruits can be in processed foods that are labeled wild. I remember some years ago when there were discussions among organic producers about the mixed blessing of the then-budding mass interest in organic products. Of course, those of us who grow and consume organic products want the concept to spread–for both our own interests and those of the planet. But we knew it was inevitable that government agencies would begin to relax standards at the behest of the big-time processors and retailers, who can hire better-connected lobbyists than the committed organic growers can. An article from earlier this month in the LA Times, from which the not-wild, not-organic hop lager story comes, suggest that this relaxation of standards is very much underway. My own advice is not only to look for the “organic” label, but to favor relatively smaller producers who specialize in organic whenever possible. If it is local, even better. If you care about the impact of your food choices on not only yourself, but also on the environment–and please do–should you aim to buy local or organic? John Cloud, writing in Time, has a piece on precisely this question that is well worth a read. The article is surprisingly good, considering its mega-media publication outlet, and in spite of some annoying passages (e.g. an utterly stupid throwaway line, “I know I’ve been listening to too much npr…,” and some irrelevant and ignorant political asides). It does quite a good job of considering the many dimensions of these decisions, and includes informative interviews with John Mackey (Whole Foods) and Nate Keller (Google’s CafÃ© 150). advocates of local eating are now making another leap, saying what happens after harvest–how food is shipped and handled–is perhaps even more important than how it was grown. I am not completely ready to endorse that statement, but I come close. If forced to make the choice, on most produce I would prioritize local over organic. Fortunately, I am in California, and I rarely have to make that tradeoff–especially if I do not insist on “fresh” fruit like grapes and plums in the winter (which will have been picked way too early and shipped thousands of miles from the southern hemisphere). the packages in which most Whole Foods groceries are sold say nothing about the food’s origin. For instance, in the freezer section you can find Whole Foods’ Whole Kitchen brand Breaded Eggplant Slices with Italian Herbs. The box tells you a wealth of information about the eggplant slices–that they contain wheat, dextrose and annatto (a dye); that they can be fried, baked or microwaved; that they have no trans fat; that they are “flavorful” and “versatile.” But you don’t learn where the eggplant comes from. Yes, this is a major annoyance to me. I just want to know. Tell me where the produce came from. UPDATE: Mike Biltonen weighs in on this issue. His blog is called Organic Schmorganic, and subtitled “Debunking the myth of organic in favor of local, ecological agriculture.” To clarify a misconcption some readers apparently (and understandably) have gotten, he says, “What weâ€™re really battling is GLOBAL organic and not LOCAL organic.” I certainly am sympathetic with that. Is organic farming ‘no better for the environment’? The headline in The Independent, regarding “The first comprehensive study of the environmental impact of food production” suggests not. However, the study, by the UK Department for Environment, Food and Rural Affairs, is evidently rather more mixed than the headline implies. [It] found “many” organic products had lower ecological impacts than conventional methods using fertilisers and pesticides. But academics at the Manchester Business School (MBS), who conducted the study, said that was counterbalanced by other organic foods – such as milk, tomatoes and chicken – which are significantly less energy efficient and can be more polluting than intensively-farmed equivalents. I don’t know much about dairy or chicken farming, but deeper into the story it becomes clear that much of the problem with tomatoes (and other vegetables) is out-of-season hothouse production. Well, no surprise there. Organic standards are one thing, but the organic spirit is one of natural methods. And growing things in heated indoor spaces because one’s climate will not support outdoor growing is a far cry from the spirit of harmony with the natural environment that organic (and, for that matter, non-organic) growers should aspire to. Advocates of organic farming said its environmental benefits had long been established, not least by Mr Miliband [the Environment Secretary] who has written it is “better for biodiversity than intensive farming“. The Soil Association said it recognised that in some areas, such as poultry and growing vegetables out of season, organic was less energy efficient. As for Ladera Frutal (which is certified organic), the heavy use of imported water to grow a subtropical crop like avocados in this naturally dry a climate does concern me. If only I could afford to drill a well or bear the up-front investment costs of converting the avocado grove to a less thirsty crop. Nonetheless, it is highly likely that any broad assessment of the impact of fruit-growing methods would be favorable to organic over conventional. Furthermore, if the alternative to growing avocados in California is buying them from Chile and Mexico, an assessment of the environmental impact would have to take into account the vastly greater insecticide use in those countries (in part due to past over-use that has killed off beneficial insects and resulted in evolved resistance) and the carbon impact of the longer-distance transportation. These considerations would be separate from the straight comparison of organic vs. conventional methods in either California or Latin America, and yet a further question would be the quality of the oversight on organic (or other) standards in developing countries. I would take home two conclusions: (1) There are more important assessments of producer practices that the informed and environmentally sensitive consumer should take into account than the simple organicâ€“conventional dichotomy, and (2) As always, the evaluative criteria employed–rather narrow in the UK Defra study–are essential to the conclusions of any study of the impact of the processes of producing our food on the environment.